Kewpies! What a bunch of cuties!! Kewpies, in case you are not familiar with them, are cute cherubic, fairy like little persons. They were created by Rose O'Neill. She was a writer and a very popular artist and illustrator when she came up with the Kewpies for a project for Ladies Home Journal in 1909. From there the Kewpies just took off, and became very popular illustrations, comics, dolls and toys. Today they are very sought after collectibles. This is my little gallery devoted to the Kewpies. Visit and smile awhile! 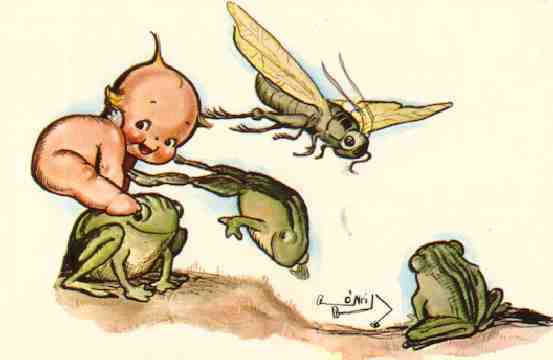 Here's a Kewp playing leap-frog! This is 'Blunderboo' called so, because he is always tumbling! Looks just like Ms. Fatty!! I love this one! Kewpies going for a dip in the well! Check out the Mer-Kewp! and the Kewp pointing down the well! So Cute! These cute antique bisque figures were up for auction at eBay. I couldn't afford them, so I just snatched the pictures of them! 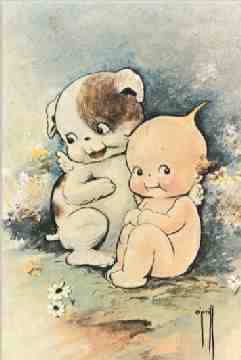 Here are some vintage Kewpie postcards.